This project is an extension of Metal Detector MkI, and shows how metal objects are detected. It is the second in a series of circuits and allows a great deal of experimentation, especially if you have a CRO (Cathode Ray Oscilloscope) and a few items to detect. You can view the waveforms and see exactly how they alter as an object is brought into the field of the coil. There are a number of ways to detect a metal object and alter the operation of a circuit so that an output is produced. Metal detectors will detect ferrous (iron, steel, stainless steel) as well as non-ferrous (copper, tin, gold, lead, silver, aluminium) as well as alloys (brass, cupro-nickel, pewter etc). Depending on the complexity of the circuit, a metal detector will be able to discriminate between a lump of gold and an aluminium ring-pull from a drink-can. The circuit we have presented in this project is very simple and works on the principle of detecting the amplitude of a waveform. This is called AMPLITUDE MODULATION. When a metal object is placed inside the detecting coil, some of the magnetic flux passes into the object and creates a current called an eddy-current. This "uses-up" some of the magnetic flux and thus less flux is available for the receiving coil. This produces a lower output from the coil and causes the second transistor in the circuit to be turned OFF slightly and the voltage on the collector rises. This allows the third and fourth transistors to oscillate and pass a signal to the fifth transistor to drive a mini speaker. Actually, both the amplitude AND the frequency of the circuit change when a metal object is detected, but we are only detecting the reduced AMPLITUDE. As you can see, the circuit consists of a number of BUILDING BLOCKS. All you have to do is understand how each block works and you will understand the whole circuit. The concepts of TALKING ELECTRONICS is to explain how various building blocks operate so you can design your own projects. You can take any of the blocks and add them to your own project, but it will be necessary to connect them together correctly. That's why you have to read our discussion articles, to learn how to interface different blocks. WHAT TYPE OF CIRCUIT IS IT ? A customer asked: What type of circuit is it? This circuit has never been given a name. That's because it is different to all the other circuits. The closest name we can apply is "GRID DIP" detector. The GRID DIP Detector circuit is a very old and comes from the days of valves. A valve had an input pin called the GRID. When the voltage on the grid was increased or decreased, the value produced a magnified output. That's what we call AMPLIFICATION. In the old valve circuit, a coil and capacitor arrangement (called a TUNED CIRCUIT) was placed near a project that contained an oscillator. When the frequency of the project was the same as the frequency of the Tuned Circuit, the voltage sent to the grid reduced and that's why it was called a GRID DIP Detector. Our circuit works in exactly the same manner. The first coil and capacitor form a TUNED CIRCUIT and when a piece of metal is placed near the coil, the AMPLITUDE of the oscillation will reduce. The second coil picks up the amplitude and amplifies the signal. When the amplification reduces, the second transistor has a gain of about 100 and the reduction in amplification will be a lot greater. For instance, if the amplitude of the main oscillator is reduced by 1mV, the second coil will see a reduction of nearly 1mV and the output of the transistor will be reduced by about 70mV. This allows the transistor to turn off slightly and the next 3 transistors produce a buzz in the speaker. (However the change will only be a few mV). 1. The first block is a FEEDBACK OSCILLATOR, consisting of the first transistor, 70 turn coil 47n and the 50 turn coil. The first transistor is turned on via the diode in the emitter of the second transistor. This diode receives its turn-on bias from the 1k8 resistor. The resistance of the Rx (receiving coil) is very small and the base of the first transistor sees a "turn-on" voltage from the voltage across the diode. The variable resistor in the emitter starts at a low value for our description of the circuit. The first transistor has a high gain at this point in time and the Tx (transmitting coil) and 47n form a tuned circuit with a frequency of approx 15kHz. The power rail is stabilized by the 5v6 zener and a small amount of noise is always present in any circuit and causes a small waveform to be produced by the coil and capacitor. This waveform is passed to the receiving coil (through the air) and a small voltage is produced across it. Since the end of the receiving coil connected to the diode, it is fixed and rigid and the signal produced by the coil is passed to the base of both transistors. The coil is connected so the voltage it produces turns the first transistor ON harder and thus the waveform produced by the tuned circuit is increased. Since the resistance of the pot is a minimum, the amplitude of the waveform will be a maximum and this will have the effect of turning ON the second transistor so the voltage on the collector will be very low. The signal on the collector will be a waveform but this is smoothed by the 100n capacitor. 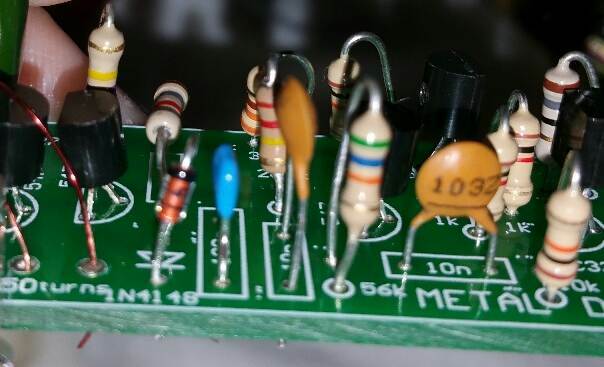 As the resistance of the pot is increased, the voltage on the emitter will increase and the base-to-emitter voltage will be LESS, so the transistor will not be turned on as much. The waveform produced by the tuned circuit will reduce. This will be reflected in the receiving coil and the second transistor will also get turned off slightly. The voltage on the collector will rise and this will be passed to the second building block. When a metal object is placed in the centre of the coil, some of the flux enters the object and causes EDDY CURRENTS in it and this flux is lost. This the receiving coil does not get the full amplitude of flux and the transistor is turned off a small amount. This increases the voltage on the collector of the second transistor and causes a tone to be produced by the next three transistors. 2. THE VOLTAGE CONTROLLED OSCILLATOR - transistors 3 and 4. The voltage controlled oscillator is simply a direct-coupled high-gain amplifier with a 10n feedback capacitor to provide oscillation. When a voltage appears on the base of the third transistor, it turns ON and this turns on the PNP transistor. The voltage on the collector of the PNP transistor rises and this pulls one end of the 10n capacitor (via a 1k resistor) towards the positive rail. The other end of the capacitor is connected to the base of the third transistor. This turns ON the third transistor. They keep turning ON until both are fully saturated (turned on). This happens very quickly and during this time the 10n capacitor starts to charge. The charging current flows through the base-emitter junction of the third transistor and as the capacitor charges, it develops a voltage across it. This causes the charging current to reduce. The third transistor gradually turns off and this turns the fourth transistor off slightly. The voltage on the collector of the fourth transistor drops and the voltage across the 10n capacitor causes the third transistor to turn off completely. This turns off the fourth transistor and now both are fully turned off. The 10n discharges through the 56k and the cycle repeats. The capacitor takes a very short time to charge and a longer time to discharge. This is why the output consists of very short spikes. Now we come to the reason why the frequency alters. As the voltage from the previous building block rises, the charge-time for the first 10n capacitor is less and thus the first transistor in the oscillator circuit is turned on in a shorter period of time. This capacitor is discharged when the two transistors are turned off and to lead of the second 10n is taken to near the 0v rail by the 1k resistor in series with another 1k resistor and the base of the driver transistor. It's fairly complex and if you have a CRO, you will notice the waveforms on the 10n capacitors go below the 0v rail. This is how the two-transistor direct-coupled amplifier turns into a variable-frequency oscillator. 3. THE DRIVER TRANSISTOR. The output of the oscillator is connected to a driver transistor via a 1k resistor. This resistor prevents high currents flowing when both transistors are turned on. The driver transistor is directly connected to an 8 ohm speaker. The 18R resistor reduces the volume and prevents large spikes appearing on the power rails. The result is a clicking sound. For this type of circuit to be successful, the supply voltage must be maintained absolutely rigid for the detecting section. This is very difficult to do as the battery voltage changes as it gets older and all the semiconductor devices change according to the temperature. The supply voltage must be as stable as possible as the circuit is detecting a very small change in amplitude and the supply voltage has an effect on the size of the signal. The circuit uses a zener diode to create a fixed supply but as the temperature of the diode heats-up with current-flow, the circuit-settings change and a tone is gradually produced by the speaker. This has to be stopped by adjusting the pot on the emitter of the first transistor. This constant resetting of the circuit is called INSTABILITY and is one of the downfalls of the design. However, for a simple circuit it offers very good sensitivity and an audio output. 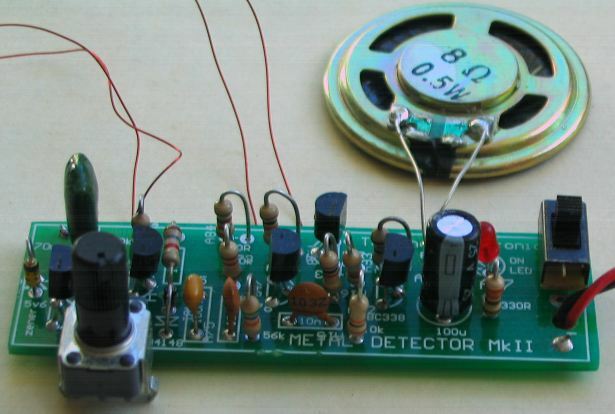 We have more metal detector circuits in the pipeline and will be added as soon as possible. Metal detector circuits are a very big part of industry, not only to detect metal particles in food but also hidden objects on persons entering various venues. They are also used to detect the difference between iron compounds and gold - such as the latest gold detectors. They are also used to detect coins for vending machines and in this instance they are generally called "coin comparators." Metal detection is a very big field, from detecting old nails in second-hand timber to mine sweeping via helicopters. This is where you start and if this area fascinates you, search the internet for more-complex circuits and design a metal detector for night-clubs and airports that will pick up a blade concealed in a shoe! You need to do it by narrow-band magnetic radiation, to build up a picture of the metal objects without any X-ray radiation dangers. It's a bit like "CAT Scanning" but the machine needs to be much less expensive. early PC boards, soldered to the tracks. When fitting the components on the Printed Circuit Board, use the overlay above to help locate the correct holes. When fitting the positive lead of the 9v battery snap, make sure you put it through the large hole and solder it to the end of the switch as well as the adjacent land. The overlay on the PC board contains additional component identification numbers that should not be on the board. The Chinese PCB Manufacturer added all the overlay layers to the Top Silk layer and this will be corrected in the next run. Here's a photo from a constructor. It shows how NOT to fit the components. HIGH and look like "trees in a forest." The diode is around the wrong way !!! Look at the previous photo to see how neatly the components can be fitted. 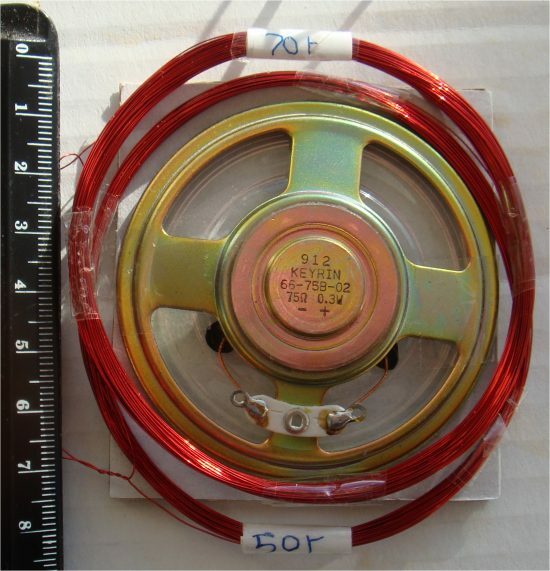 The diameter of the wire and the size of the coil is not critical however our prototype uses 0.25mm enamelled wire wound on a 70mm diameter former. The 50 turn and 70 turn coils. Unwind the wire you have received and place it along the floor in a long line so it can turn around on its axis when winding the coils. This will prevent the wire twisting on-itself and kinking. The two coils must be placed on top of each other and changing the number of turns of the receiving coil does not alter the sensitivity of the circuit. The transmitting (oscillating) coil is 70 turns and the detecting coil is 50 turns. The two coils must be placed together and covered with tape to keep them together. But check the "Setting-Up" section before taping them together. Make sure the 70t coil is connected across the 47n capacitor as the circuit will not work if the coils are exchanged. Don't worry about the correct connection of the second coil as it can be turned over if the circuit does not work. The circuit will detect a small button cell about 7cm above the coil. The diameter of the coils can be changed and the number of turns can be changed. BUT you must start with the coils supplied in the kit. One reader changed the coils to 100mm and the project did not work. You MUST change the diameter or the number of turns a very small amount and see if the coils have to be closer together or further apart to get the circuit to work. You will have to adjust the pot to get the circuit to work. The 47n may also have to be changed to a higher or lower value. The author has not done this and you will have to experiment on your own in very small steps because if the circuit does not work, you will not know how to bring it into operation. Basically, the theory is: the larger diameter will produce deeper penetration, but this also requires the coils to be supplied with more energy and will require a higher supply voltage. All these things can be tested, providing you do it in small steps. You can add 10 turns to each coil and make sure you label each addition by providing an exposed join (called a "tap" - tapping) with a tag. You can use an alligator clip to select each tap and test the performance against the original capability. Once you have an improvement, send photos and circuit to us for inclusion in this project. Keep the two coils slightly apart and set the 500R pot to mid-position. The output will produce a tone. Slide the coils slightly closer together and turn the pot to stop the tone. If the tone does not stop, turn one of the coils over. If the pot has no range, remove one turn of the 50 turn coil. Keep doing this until the two coils are touching and the pot has mid-range. Tape the two coils together. Adjust the pot until you get a very low-frequency clicking noise. This is the most sensitivity setting. The sensitivity of this design, using a 25mm-diameter coin, gave a clear signal at 150mm.